You know what I love about boardgaming in this day and age? The fact that no matter how many clones, reskins, copies, and uninspired interpretations of existing formulas we get, there’s still room for unique takes, fun themes, and fun artwork to push all the bad aside and hone in on the fun. Enter Camping with Sasquatch from Lethal Chicken Games, a neat, little party card game (scaling upwards from a minimum of 2 players) that’s fun for the whole family, keeps you engaged for the entire duration of a turn, and goes by fast thanks to a very simple core mechanism: draw one card, play two. We’ve had the pleasure of trying out this game, which is heading to Kickstarter soon, and we’ve been taken by its fun, lighthearted blend of quick play and nonsense brought about by the overdriven set-collecting theme. The gist is this: you’re trying to be the first to get rid of all the cards in your hand. There are several suits (both in colour as well as mini-theme), for example camping, or rafting. Three cards are laid out to start the table and players will keep altering the state of it based on what they play each turn. When a player manages to match 3 cards, they get the set, which will turn into points at the end of it all. Any cards you’re left with in hand at the end count against your total points. Simple enough, right? The monkey wrench comes in the form of the various monkeys in the game. The Sasquatches may be used as “jolly” cards to fill in a row of their suit, or as a trigger for an all-out race to see who’s the quickest at “slapping” cards of a matching suit down on top of them, with the slowest (the one who slaps down the top-most card) having to draw the lot. While most turns are rather civil (with Sasquatches making up only ¼ of the game’s deck), with the draw and play going by without much fuss, you’re always going to want to be on edge and pay close mind to what’s being laid down as someone may call out “Fishy Sasquatch!” and have the rest of the table scrambling for a matching card to slap and hopefully get rid of. These moments of spiking action across a rather mellow game make for a lot of laughs and giggles, especially if you factor in the small dexterity element. Fans of Jungle Speed will know what I mean by that, with CWS being somewhat similar to it, at least in this regard. There’s also an enjoyable aspect to the set collecting, with all sets making thematic sense, which is a hard thing to come across in this kind of game. The 8 sets are all different colours and mini-themes, made up of 3 different cards each accompanied by a related Sasquatch. The Camping set, for example, features a ‘squatch, a sleeping bag, a tent, and some mosquito-b-gone, with the monkey in question being depicted as entangled in a mess of ropes and canvas, as camping people are wont to do at one point or another. While many of you may say that this isn’t that big a deal, especially since matching a set can also be achieved by linking 3 identical cards in a row, the simple notion that the sets make sense gets a big thumbs up in our book as the people at Lethal Chicken Games put some thought into this and didn’t just paint some random shapes on a deck of cards and tried to sell it. The artwork itself falls on the cutesy side, and while not spectacular it serves its purpose admirably and will definitely catch the eye of the young’uns you may have around the table. We’ve played this in two (slightly different rules on the Sasquatch), four, and five players and felt like it scales pretty well across the board, the play time doesn’t get obnoxious, and the game doesn’t bog down at all. The game goes live on Kickstarter June 19th, with two main pledge levels: $18 for the standard version, and $27 for a slightly more deluxe product. The game will go to retail soon after becoming available to the KS crowd, and for a similar price tag. And with the production team’s second Kickstarter to date (after a very successful first outing), we’re expecting a positive outcome once it’s run its course. 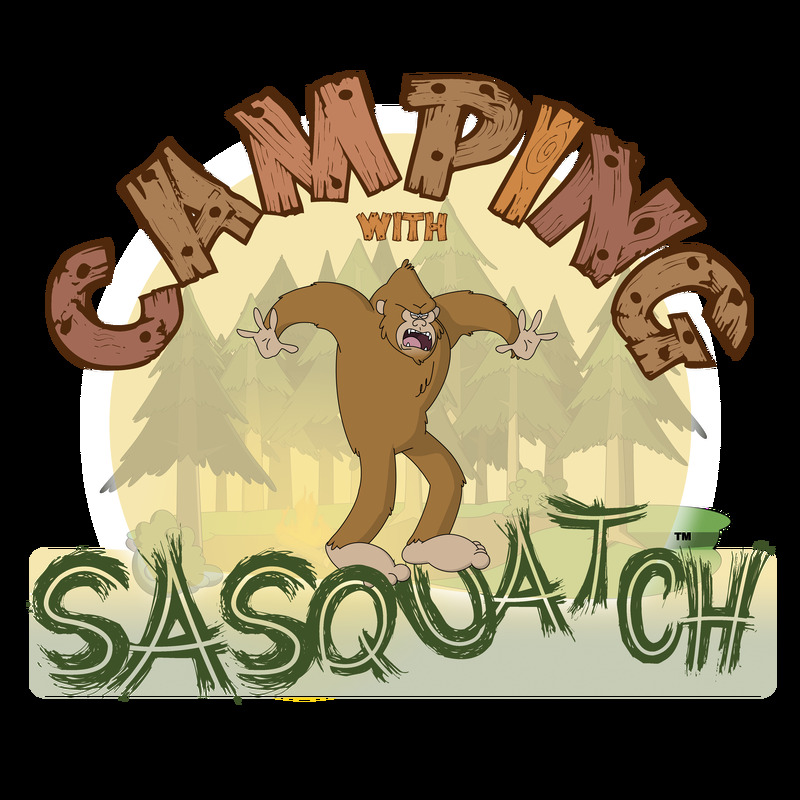 We’ve had some good laughs playing Camping with Sasquatch and definitely feel like it ticks all of our boxes for a lighthearted party game: it gets the group around the table, keeps everybody invested in the activity at hand, and is fun and quick enough to merit repeated plays in one sitting!